Please note that I gave this book 4.5 stars, but due to Goodreads not allowing half stars, I rounded the book up to 5 stars. 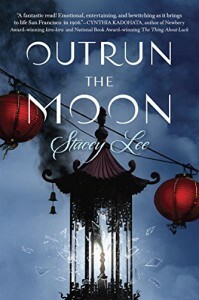 I have never read a novel by Stacey Lee before, but I am going to definitely check out her other books when I get some time. "Outrun the Moon" was a great look back at a tragic event in the city of San Francisco's past (1906 Earthquake) told from the first person point of view by 15 year old Mercy Wong. I can honestly say that I am totally ignorant about all of the former laws and policies previously enacted in the United States passed in order to segregate Chinese and American born Chinese people in our country's past. I am actually a little ashamed of myself for not looking deeper into that especially since everything that Ms. Lee provided context about just caused me to want to read more and more and more. I visited San Francisco a few years back for a friend's wedding and the city spoke to me like no other place has since. There are just some places that touch you and make you feel like you came home. I recall being fascinated by everything and I did a Big Bus tour around the city that briefly touched upon the Earthquake of 1906. But even with that context, I still had no idea of the devastation that people were forced to deal with for several days after the first quake. "Outrun the Moon" takes place a few days before the San Francisco earthquake. Mercy Wong is determined to be enrolled at the St. Clare School for Girls in order to further her education. Mercy believes that if she is able to attend this school she will be able to use what she learns there in order to set up her own successful business. Living in San Francisco's Chinatown with her mother, father, and younger brother Jack, Mercy dreams of being able to make enough money for all of them to live in Nob Hill one day. Using "bribery" Mercy is able to get her foot in the door at St. Clare's, but finds that it may be harder than she thinks to be able to get what she really wants. Mercy was a wonderful character. She is a 15 year old girl who is doing what she can in order to make sure that her family can be better off. Being the oldest and a girl you get to see how hard she is fighting to be taken on her own merits and not to be treated like a Chinese girl who is not as good as the white people she sees living in better off circumstances around her. Mercy's constant parroting of lines from a business book written by a businesswoman definitely made me smile after a while. I used to do that too when I was younger. Read something that stuck with me and would just repeat it back to friends and family. Thank goodness no one smothered me. There were parts of me that did get a little bit frustrated with Mercy. I think it was because I wanted her to be cautious and be safe a lot of times during the story, but the character at that point was over everything and said screw it, I am going to do what I am going to do, and damn the consequences. Other characters included in this book are Mercy's mother, father, her younger brother Jack, her longtime childhood friend Tom, and the girls that she meets at St. Clare's. There are a lot more characters introduced to you as soon as the action moves to St. Clare's but the big stand outs for me were Harry, Francesca, and Elodie. I would seriously love to see a sequel showing how did all of these girls turn out one day. Though we don't get much insight into Mercy's family life besides crumbs left here and there, I felt their presence through the whole book. I will be honest though that the character of Tom did not do a thing for me. I loved Mercy's relationship/friendship with Francesca more. Those two together were fantastic. The writing was really good. I know some words here and there from other friends so I already knew what "gwai lo" meant. Ms. Lee has Mercy explain things so I don't think any reader would get lost. Mercy's voice is very distinct the whole way through and read like a 15 year old girl. The flow though was way too slow at the first half of the book, and the beginning of the book felt like it started mid-story to me. It read like the reader should already know what Mercy was up to. Nothing got explained there for a few chapters later for you to get why Mercy was out looking for a certain herb. The world building was fantastic to me because this book took real life events and sections of a city and breathed life into the book. The ending came a bit too fast for me. There was kind of a little cheat I would say surrounding some of the characters. I think that Ms. Lee wanted to make sure that whatever reader came along was not totally thrown into a pit of despair.